The Fly is made of two stainless-steel tubes making it the purist in the lightweight class. Less is more; 369 grams takes 18 kilos of luggage. Making this model even more efficient than it already is would be almost impossible. With the Fly, optical pleasure and function work in perfect harmony. - Wheel Size: Unisize 26" / 28"
Would the Tubus Fly fit a bike with disc brakes - specifically a 2017 Giant Rapid 0, or would an adaptor be required? If not, can you recommend another lightweight rear rack that would fit? 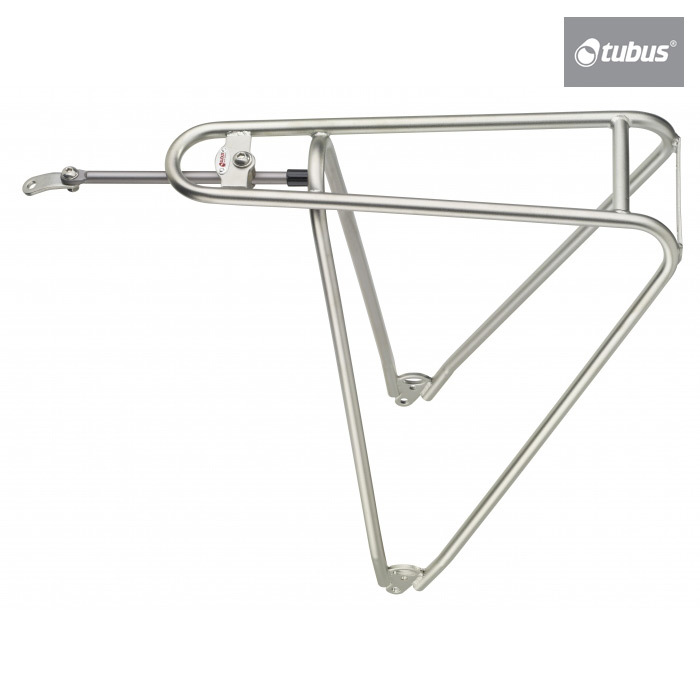 This rack is not normally designed for bikes with disc brakes, but due to the position of the caliper on your bike it should not interfere with the rack. This means you should be able to fit this rack to your bike without the need for an adapter. Is there any small rack top bag to fit this rack? This rack was never designed to have a rack top bag fitted to it, this doesn't mean that you definitely can't it just means that we can't recommend any as they would either fit poorly or would require some form of modification to fit. I am looking for a light weight pannier rack. Can you use the Ortlieb Back Roller classic panniers on this rack? Which would you recommend the standard rack or the stainless steel? I have a road bike with rack fixing lugs. You could fit a set of Ortlieb back roller classic panniers onto this rack but you may have an issue with heel clearance. Due to the short nature of the rack they normally work better with smaller panniers or front panniers as these sit further back due to their shorter size. The stainless steel rack is a better quality of rack but if you're not going to be taking overly large loads and you're not that worried about the weight or finish then the standard is a perfectly good option. As you already have the mounting points it should be relatively straight forward to fit.